Want to learn more about making your own garments that rival ready-to-wear? Register for The Tunic Bible Workshop with Sarah Gunn and Julie Starr in April, 2019! As a bonus, anyone who registers may attend the Meet and Greet with Julie and Sarah the evening before for free! 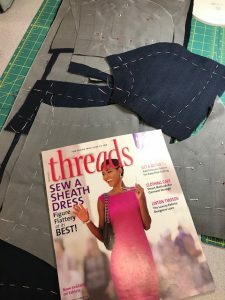 Helen’s article on the cover of “threads” magazine. noun ~ the design and manufacture of fashionable clothes to a client’s specific requirements and measurements. We had to look up the definition to make sure we fully understood. After watching this amazing process for three days — we now fully understand! A classroom filled with sewing talent worked into the night creating their muslins and then fitted them to perfection. Then beautiful fabrics were cut, basted, marked, pressed, sewn and put together all under the watchful, discerning eye of Helen Haughey. Helen is a sewing ‘rock star” of sorts with her work having graced the cover of Threads magazine. We were so honored to have her in our stores and to learn from her — and there was so much to learn! As our stores begin their journey into garment making education we unknowingly started with the best at the suggestion of Connie Murphy founder of the Florida Garment Makers Group. Watch for the next step in our journey in April as we welcome Sarah Gunn and Julie Starr authors of “The Tunic Bible”. They will be teaching one pattern with interchangeable pieces based on their book. Previous Previous post: The Best of Baby Lock – SEW Much Fun Right Around the Corner!